Hello again, beautiful people of the earth and beyond! What an amazing show we had this Wednesday. If you didn’t tune in, you missed some awesome life hacks and more! It was a bit of a different show, we didn’t have most of the segments we normally do but we did have our very own station manager Terrence “TJ” Mroz in the studio and I got to ask him some great questions about his own life, his time with Radio Laurier so far, the opportunities available with Radio Laurier and WLUSP overall, and we even got some solid advice and life hacks from a seasoned campaigner on how to enhance your university experience. Needless to say, I got a lot of cool advice on how to get more involved, and I’m sure all of y’all listening, loved everything he had to say as well! That said, before the interview, we did get on with some amazing throwbacks, mostly from the 2000s, bringing back some amazing memories and making me feel extremely old *sob*. How sad is the feeling when you remember exactly when you first listened to a song and it’s now over 12 years old? That’s exactly what happened to me with Don’t Cha– Pussycat Dolls. I remembered reading on CP24 about how well the song was doing when it came out and it’s been over a decade since then #OMG. 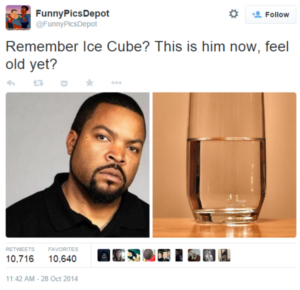 Just like the tweet on the right here, I definitely felt real old, real quick. DJ Thr0wback also discussed the weird enigma that was Jay Sean‘s career: from shining in The UK, to coming out with a bang with his “All or Nothing” album, he topped the charts with his single, “Down” featuring Lil’ Wayne, only to lose the success over the years and never got to the same heights again.